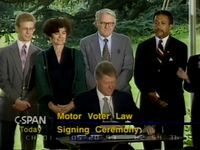 The National Voter Registration Act allows Americans to register to vote when renewing their driver's license. It was passed by Congress in 1993. This page was last modified on 1 December 2016, at 15:27.